The treated waste - if sufficiently sterile - can generally be disposed with general waste in a sanitary landfill, or in some cases discharged into the sewer system. In the past, treatment of medical waste was primarily performed on-site at hospitals in dedicated medical waste facilities. Over time, the expense and regulation of these facilities have prompted organizations to hire contractors to collect, treat, and dispose of medical waste, and the percentage of medical organizations that perform their own treatment and disposal is expected to drop. To ensure that each treatment method provides the proper environment for the destruction of biologicals, test indicators for microbiological spores measure the treatment effectiveness. Microbiological spores are the most difficult of biologicals to destroy, so when the test package cannot be cultured after treatment, the waste is considered properly treated. In treatment methods where shredding or maceration is employed, the test package is inserted into the system after the shredding process to avoid physical destruction of the test package. The test package is then retrieved from the waste after treatment. According to the EPA, 90% of medical waste is incinerated. Incineration is the controlled burning of the medical waste in a dedicated medical waste incinerator. Among industry folks, these units are often referred to as hospital/medical/infectious waste incinerators (HMIWIs). The waste generally passes through the incinerator on a belt, and because most medical waste can be incinerated, the waste is not sorted or separated prior to treatment. Incineration has the benefit of reducing the volume of the waste, sterilizing the waste, and eliminating the need for pre-processing the waste before treatment. The resulting incinerated waste can be disposed of in traditional methods, such as brought to a landfill. The downside of incineration is potential pollution from emissions generated during incineration. The EPA has stringent requirements on emissions from medical incinerators. The incineration process can be applied to almost all medical waste types, including pathological waste, and the process reduces the volume of the waste by up to 90%. Modern incinerators can provide a secondary benefit by creating heat to power boilers in the facility. The largest concern associated with incineration is air pollution from emissions. 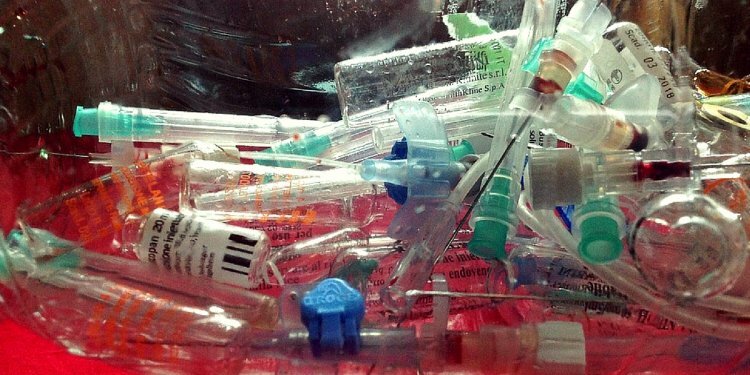 The EPA says that at least 20% of medical waste is plastic. The biggest concern is that the incinerator may create toxic compounds. Dioxins and furans can be produced when these plastics burn. Older medical waste incinerators included no pollution control equipment. As new federal and state emission regulations are instituted that have more stringent requirements, medical incinerators are often not being replaced at the end of their service life. Over time, the amount of waste being incinerated will be reduced as other technologies replace on-site incinerators. Another concern is incinerator ash. As incinerators are designed or retrofitted with pollution prevention equipment, more of the potentially toxic chemicals that previously ended up in emissions now remain in the ash. Incinerator ash is generally disposed of in landfills. The public often has an aversion to incinerators and may raise objections if they hear one is being put in their area. The popular perception of incineration is informed by pictures of open pit burning done decades ago in the US and still today in some countries. Open pit burning is indeed not effective enough and results in smoke and other undesirable materials being released to the atmosphere. Most people don’t understand how incineration units can be made clean-burning and engineered to reduce the risk of dangerous releases. Most people also don’t understand how many incinerators are in their area already.